As the Muslim world continues to display severe anger management issues over Israel’s initial decision to install metal detectors at entrances to the Temple Mount after the murder of two of our police officers up there – even though we capitulated and now rolled back the detectors and security cameras – it bears reminding that before Israel regained control over the old City of Jerusalem, Jews were not able to access the Western Wall (except sometimes, at a price). I am not even speaking about the period during Jordianian control between 1948 and 1967, but even earlier than that. 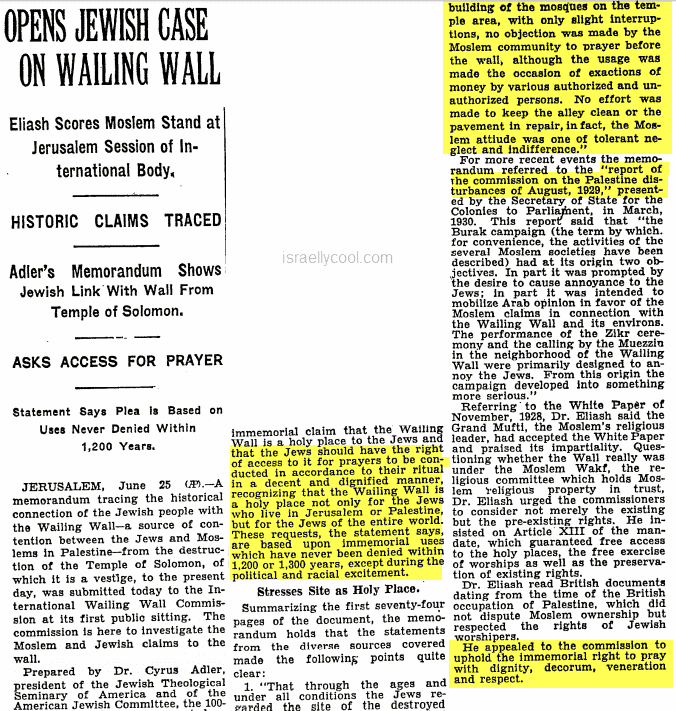 In 1930, the situation was so bad that an International Wailing Wall Commission sat for the first time. 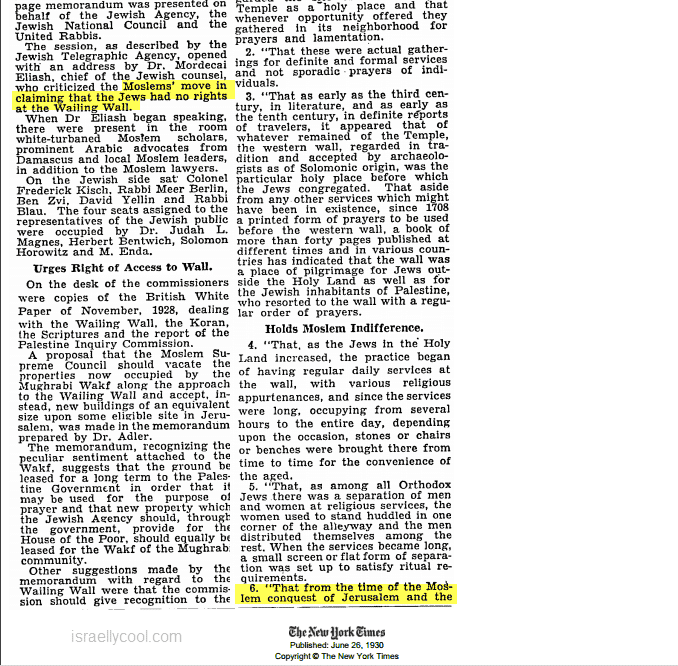 We had to submit a case as to why the Wailing Wall was so important to us so we could pray there, while the Muslims claimed we had no rights there at all. I kid you not. This actually happened. Note: I cannot provide a link to the full articles since they are only available to those who have purchased a NY Times subscription. But I have provided screenshots below. As usual, click on the screenshots to enlarge. A number of weeks later, one of the sides called for a strike in protest. No, it was not the Jews, the truly aggrieved party here, whose rights of access to their holy site were not being respected. It was the Muslims, the oppressors, who objected to the Jews wanting to pray there. 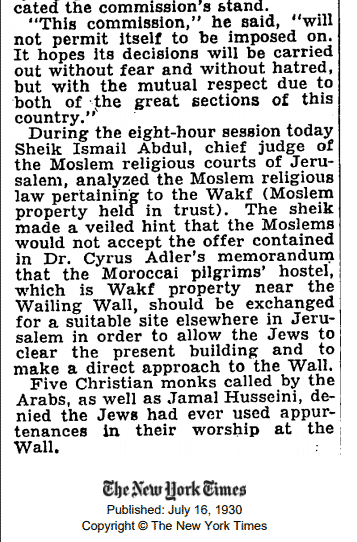 After we regained control over the Old City in 1967, we magnanimously (but stupidly) allowed the Wakf to maintain control over the Temple Mount. 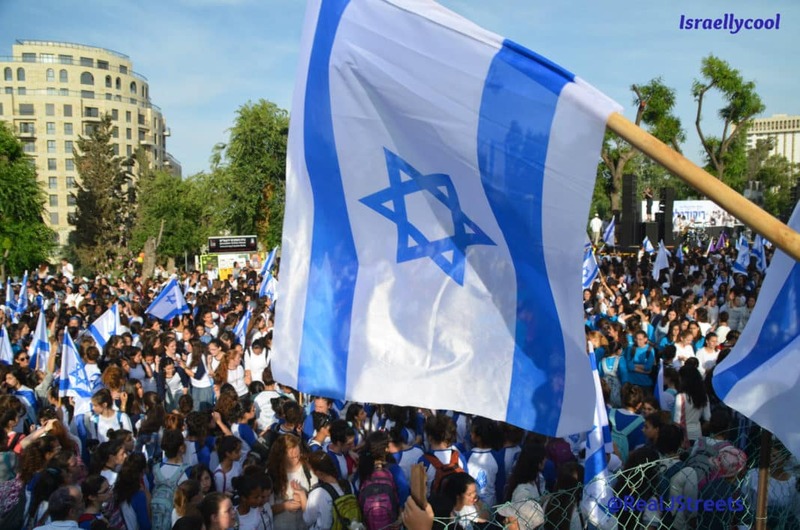 Muslims have had unrestricted access to this area, and Jews have not. 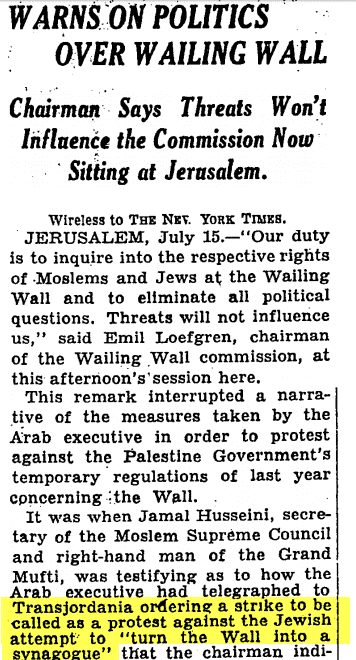 Yet now the Muslims have the chutzpah to threaten violence over some reasonable security measure, even after their history of denying us even the most basic of access to the Western Wall, which is not even as holy to us as the Temple Mount.